IBM Watson Health’s supercomputing abilities in the area of cancer treatment once again come under fire as Stat uncovers internal IBM documents showing employee and customer concerns with the software. “Unsafe and incorrect treatment recommendations” for cancer have been blamed on Watson’s training — by IBM engineers and a team of physicians at Memorial Sloan Kettering Cancer Center (NY) – that used hypothetical instead of real-life cancer cases. A Jupiter Hospital (FL) doctor complained to IBM, “This product is a piece of s***. We bought it for marketing and with hopes that you would achieve the vision. We can’t use it for most cases.” (the irony being that a hospital that admits buying Watson for its marketing value complains about the company’s overzealous marketing). 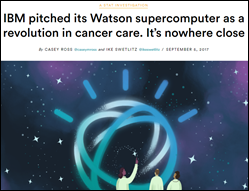 A previous Stat report found that IBM started marketing the oncology product before it was ready and without subjecting it to clinical studies, also noting that Watson doesn’t meet the definition of AI since it doesn’t actually learn, it only relays the treatment preferences of MSKCC in what is little more than a virtual consultation. 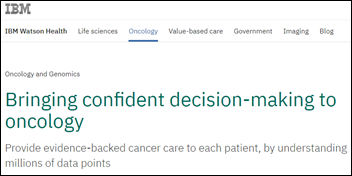 Oncologists also reported that while Watson provides them with background information such as journal articles, it doesn’t directly help them make a decision or tell them anything they don’t already know in regurgitating the hospital’s own training data. It also suffers from lack of clear-cut medical evidence that makes many oncology decisions difficult to turn into algorithms. MD Anderson Cancer Center (TX) cancelled its Watson partnership in February 2017 also spending three years and $60 million trying to create an oncology advisor similar to the one MSKCC is developing. IBM Watson Health confirmed in early June that it had laid off an unspecified number of employees, mostly from its expensive acquisitions Truven, Merge Healthcare, and Phytel. From A Good Walk Ruined: “Re: Sutter Health. Heard that the Sutter board met Wednesday morning and let CIO Jon Manis go because of its $25 million recent downtime. I’ve also heard that the CFO and COO were let go.” I reached out to Sutter, who confirms that SVP/CIO Jon Manis (photo above), IS Chief Operations Officer Stuart James, and Director of IS Finance Randy Davis have left the organization for unstated reasons. Serving as interim CIO will be Chris Van Pelt, who I believe still works for PricewaterhouseCoopers. Sutter’s Epic and telecommunications systems went down for more than a day in mid-May at its 24 hospitals, which the health system said was due to activation of a data center fire suppression system. From Careening Corvette: “Re: Medhost. Lists an open position for chief information security officer after having their share of security problems in the past 24 months.” The job sounds like the one William Crank has held, but he still lists it on his LinkedIn. From Eligible Bachelor: “Re: Recondo. Appears to be buying the former Advisory Board PayNav client base from Optum 360. PayNav was a white label for Recondo products. Terms not disclosed, transition of 57-58 clients beginning immediately.” Unverified. From Joel Martin: “Re: physicians and EHRs. 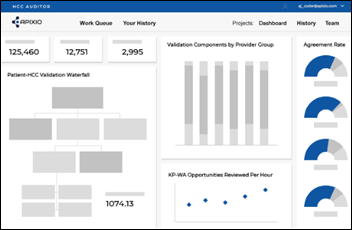 I spent many years working on Epic optimization, especially for inpatient and ambulatory physicians, and most of the complaints about time and user friendliness are actually about regulatory, financial, and other compliance requirements. Very few of the issues they disliked were actually attributable to the software other than poor defaults for orders. Even note documentation, by far the biggest time spent, is really about a financial decision of the organization to shift cost away from transcription that all EHRs can accept. Individual healthcare organizations and the system as a whole have shifted enormous amounts of work onto physicians over the past 20 years. The EHR enabled a lot of that shift, but is not the cause, and the best EHR possible cannot undo this reality.” I agree with Joel, who’s now with HealthX Ventures– it’s like blaming TurboTax instead of Uncle Sam for the unpleasantness of paying taxes. The worst aspect of the EHR is that it gives non-clinicians a sly way to impose their will on doctors anonymously via software requirements, turning medical documentation into a Pavlov’s Dog experiment in which dollars pop out as a reward for doctors clicking boxes someone wants clicked that don’t necessarily benefit patients and instead steal a big chunk of their allotted encounter time. Healthcare is the only industry that requires its highest-educated, lowest-supply professionals to perform data entry work, keyboarded into submission by executives who wouldn’t be caught dead using a computer while speaking to someone (ever see a CEO’s sumptuous desk hogged by a computer monitor?) I’ve mentioned my $60-per-month all-inclusive concierge PCP, who doesn’t use an EHR and who instead conducts an unhurried, richly nuanced conversation with me, free of the pressure to click, stare at a screen, or wonder if he’ll have his payment denied by a bored insurance company clerk ready to pounce on a mistyped field. The biggest mystery to me is why doctors allowed insurance companies and then hospitals to elbow them out of their own profession and turn them into regularly whipped slaves, or more accurately, why they don’t bolt en masse right now, skim the cash-paying patients, and let the rest of the system crash and burn so we can start over. 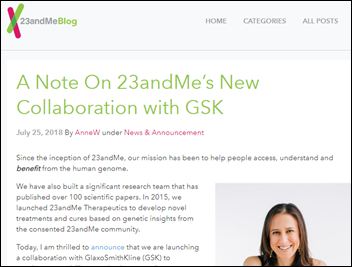 Home DNA testing company 23andMe will sell the data of its 5 million customers to pharma giant and just-announced $300 million company investor GlaxoSmithKline for developing new drugs, raising the question of why consumers shouldn’t be paid – even in the form of a rebate — when a for-profit company they’ve paid for services sells their health data to another. 23andMe, which says its consent allows such sharing and requires consumers to opt out otherwise, also acknowledges that it’s doing its own drug development. Meanwhile, Canada’s border patrol is reportedly accessing ancestry websites to determine the nationality of those being considered for deportation. Atlanta-based billing company Patientco raises $28 million in a Series B round led by investment firm Accel-KKR. Medical information sharing startup Ciitizen prepares for a private beta program with $3 million from Andreessen Horowitz. Founder and former Apple health technologies director Anil Sethi sold a similar company, Gliimpse, to Apple in 2016. Up to 1,500 Epic employees begin filing individual overtime claims — some dating back to 2012 – after a Supreme Court ruling that prohibits them from filing as a group. The company settled a similar overtime case with employees in 2014 for $5.4 million. 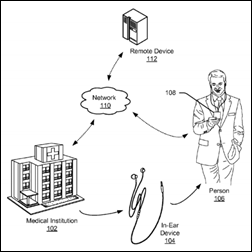 Google patents headphone technology designed to capture a user’s body temperature and alert them to changes that may indicate the onset of illness. Financial technology vendor Flywire raises $100 million in a Series D funding round. The company – which offers universities, healthcare organizations, and business the ability to accept online payments in the customer’s own currency – operates OnPlan Health, a full-service patient billing and payment solution for hospitals. A Facebook warning about slowing revenue growth sends shares down 20 percent Wednesday, wiping out $120 billion in market capitalization. It’s the largest one-day valuation slide in history for a US-listed company, with the lost market value exceeding the entire valuation of 90 percent of companies in the S&P 500. Lloyd Mangnall (Imaging Advantage) joins AbleTo as SVP of technology. Healthcare-focused investment banking firm Edgemont Capital Partners hires Kojo Appenteng, MBA (Credit Suisse) as managing director, where he will create the firm’s healthcare information technology investment banking platform. Healthcare data science company Apixio launches HCC Auditor, an AI-powered solution that helps health plans and providers perform internal audits of their risk adjustment payment data. HBI Solutions develops predictive algorithms to help providers identify patients at risk for opioid abuse. Centura Health (CO) implements health data exchange software from ESO Health to give its 17 emergency departments real-time access to EMS data. HealthSparq adds timelines and insurance-specific cost estimates for patients who use its HealthSparq One transparency and guidance platform. Agilon Health will use HMS Essette care management software for its PCP customers. Indiana HIE will deploy Diamater Health’s data interchange, clinical data quality, and e-clinical quality measures products. Columbus Regional Healthcare System (NC) selects Avaap to implement its new Cerner CommunityWorks software. Hartford HealthCare (CT) will implement data integration and analytics and reporting software from Innovaccer across its 70 ambulatory facilities. Flagler Hospital (FL) selects clinical variation management software from Ayasdi. CMS’s proposed outpatient reimbursement takes aim at hospitals that have bought physician practices to take advantage of a billing loophole that allows them to immediately raise prices by declaring the practice a hospital outpatient department (a practice closed to new conversions since 2015, but with existing sites grandfathered). The proposed change would mandate site-neutral payments to eliminate that advantage. The American Hospital Association responds quickly in saying that CMS doesn’t understand how hospitals operate. CMS reverses its decision to suspend the Affordable Care Act’s risk adjustment payments, citing the need to keep payers from becoming insolvent or withdrawing from the market. An investigation by USA Today into maternal deaths during or just after childbirth reveals a chilling lack of attention to patient safety protocols, resulting in the preventable deaths of 700 women each year. A review of hospital quality records from facilities in New York, Pennsylvania, and North and South Carolina found that less than half of maternity patients were treated for dangerous blood pressure levels; of those that were treated, less than 15 percent received recommended care. 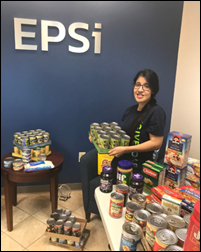 EPSi employees donate to local food pantries in honor of Global Impact Day for Hunger Relief. Elsevier will offer its STATdx online radiology diagnostic decision support tool through MModal’s Fluency for Imaging speech recognition and workflow management system. EClinicalWorks will exhibit at the 2018 FACHC Annual Conference July 29-August 1 in Fort Lauderdale, FL. FormFast will exhibit at the FHIMA Annual Convention July 29-August 1 in Orlando. The InterSystems IRIS Data Platform is now available in the Google Cloud Platform Marketplace. Kyruus will exhibit at the Virtual Health Care Summit July 30-August 1 in Boston. Indiana Health Information Exchange continues its collaboration with Diameter Health after successfully piloting the company’s Fusion, Analyze, and Quality applications. Meditech Senior Government Affairs Manager Barbara Hobbs joins the HIMSS EHRA Executive Committee. Audacious Inquiry hires Danny Krifcher (Aledade) as CFO, Marnie Basom (Health Management Systems) as senior director, and Kate Ricker-Kiefert (Amelia Mayme Consulting) as director. Parallon Technology Solutions receives the HDI Team Certified Pinnacle of Excellence award for its commitment to customer service. I hope this sentiment becomes the norm when it comes to figuring out how to fix the healthcare system. If healthcare can become consumer-driven and physicians follow suite, the insurance companies and all of its tentacles will be forced to make a change. It can’t come soon enough. I’ve seen this happen twice. 1) Halon discharged while people were in the server room. Main data center was down for a day but we could operate redundantly on the backup data center across town. 2) Just after consolidating to a single data center (I know, right?) a building maintenance guy was doing something to the system but didn’t turn off the auto-power-cuttoff for when it depressurizes. That took us down for a few hours since we no longer had a backup data center. You mean documenting what you do to care for your patients? I can’t think of a single other job where a person doesn’t have to demonstrate, one way or another, that they did their work in order to get a paycheck. If you want to go back to all-cash, all-the-time that’s fine I guess, but now we’re right back to the problem of people not being able to afford care, which is the reason why we have insurance to begin with — its a hedge against financial ruin. “Letting the system crash and burn” means an awful lot of suffering and dead human beings, so I’m not sure why anyone would wish that. Medical care cost money, and there are three options that I see: 1) cash — which leaves poor and even middle-class people out in the rain, 2) commercial insurance — which is reaping guillotine-worthy profits off of people’s misery, or 3) nationally-funded / public-option health services like every other industrialized nation. With the first option you eliminate a significant portion of your patients, so you’re still not going to get paid and they’re going die I guess, and with the other two you’re going to have to do paperwork to demonstrate that you are actually taking care of people and they are theoretically getting better, because someone is signing your paycheck and needs to know that you’re actually doing something earn it. Looks like ol’ Big Blue, even with its sophisticated project management approach, can fall into that old tech trap just like the little guys. That’s an interesting argument since I’m fanatical about the “less vs. fewer” argument, although I’ll go with publication-related style guides rather than online dictionaries, and even they aren’t consistent. Some of them support your argument that when the “thing” being referred to is countable, then use “fewer” rather than “less.” Others disagree, noting that sometimes it just sounds weird. I’ll go with using “less” to describe percentages or other collective concepts. Although I’m thinking this through while standing in the grocery store express lane that is marked “15 items or less” since I have fewer than 10 minutes before my dentist appointment. My ninth-grade Speech teacher once called me out on the less/fewer thing in front of the whole class, with the result that I will never again say “less than five languages”. However, my balance point between what might be strictly correct and what sounds right is that I reserve “fewer” for things that can’t come fractionally – so, I have fewer than ten cars, but less than a million dollars. Here’s the mystery made clear. Money, that’s it moola! Remember the first medical insur companies were started by docs. Blue Shield in 1939. Why? Because health care costs too much, people wouldn’t go to docs/hospitals so the providers weren’t making enough money to keep the doors open. In 1972 the FTC made AHA and AMA spin-off the Blues, but by then the docs and hospitals were addicted to big revenues. Along came expanded health insurance via union negotiations in the 50’s, and more big-very big- money in 1966 via Medicare. In a nutshell…providers all got ‘addicted’ to the moola. Now the question is can they kick the habit by taking a big income cut?? My guess is some will, most won’t. Those that don’t will continue on as indentured servants to a very chaotic system, and of course, keep complaining about their masters. Re: Healthcare is the only industry that requires its highest-educated, lowest-supply professionals to perform data entry work, keyboarded into submission by executives who wouldn’t be caught dead using a computer while speaking to someone (ever see a CEO’s sumptuous desk hogged by a computer monitor?) I’ve mentioned my $60-per-month all-inclusive concierge PCP, who doesn’t use an EHR and who instead conducts an unhurried, richly nuanced conversation with me, free of the pressure to click, stare at a screen, or wonder if he’ll have his payment denied by a bored insurance company clerk ready to pounce on a mistyped field. We must remember that in the “paper” or “analog” days, most clinicians took notes while speaking to patients so that they had a “medical record” of what transpired during the visit. These notes (SOAP, scribbles, whatever) were retrieved when the patient returned and/or when the clinician revisited the patient (e.g., in the hospital) so that the clinician had a handy “memory jogger” and/or quick analysis of the patient’s progress/lack of progress, test results, etc. Because the earliest EHRs were based on existing clinician workflows, the EHRs merely copied the paper/analog workflow routines. What’s pitiful is that 40+ years later, the usability factors of the most popular EHRs have not changed, with companies blaming external regulations as the reason entire product re-writes have not occurred to make the EHRs more 21st century (e.g., Facebook-like) and less 20th century, while still storing key information. Please help me to understand how EHRs should become “Facebook-like” and how EHR users will appreciate that.